An unnamed tree sitter eats some bacon which was a gift from local residents. 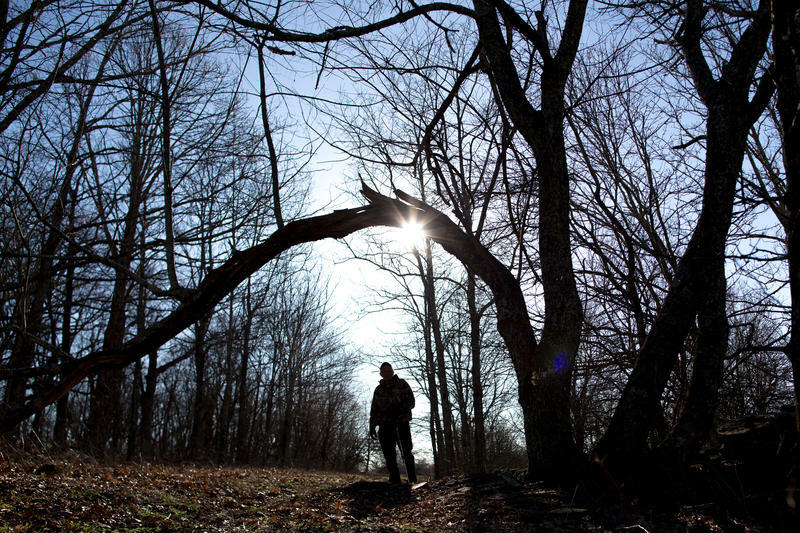 It was unexpected to have people sitting in trees in the first place, but several people have been camping in the treetops on Peters Mountain since February 26. It’s all in an effort to stop progress on construction of the 303-mile-long Mountain Valley Pipeline (MVP). The natural gas pipeline company sought a court injunction, and Monroe County Circuit Judge Robert Irons indicated he was inclined to rule in favor of MVP. The company only needed to file follow up documentation showing they did, in fact, have proper permissions to cut the trees in West Virginia. But questions arose and the judge wanted to know exactly where the tree sitters were and exactly where MVP has permission to cut trees. He called the two sides back in court. “We’re talking very small measurements, what it appears like to me,” Judge Irons said from the bench this week. 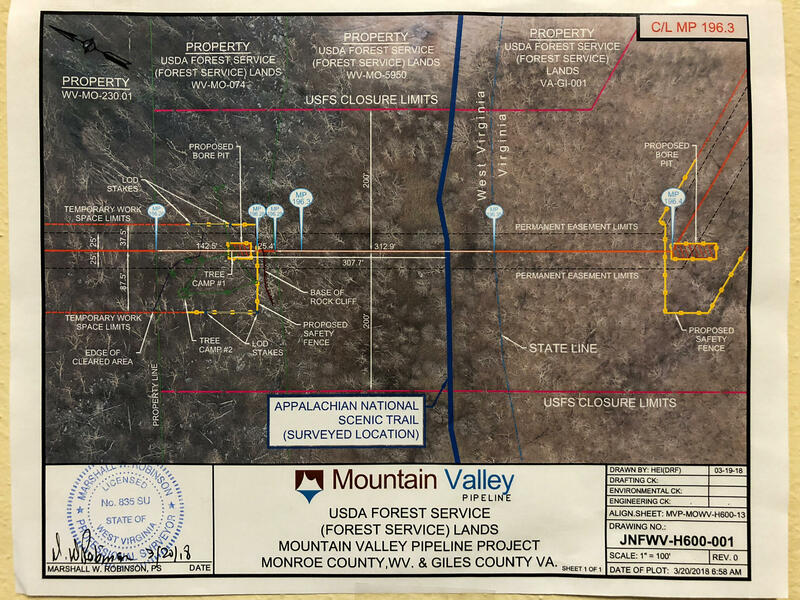 At the center of the courtroom debate was a map, provided by MVP, showing the location of pipeline mile markers, the Appalachian National Scenic Trail and the tree sitters in Jefferson National Forest. The Federal Energy Regulatory Commission, known as FERC, has granted MVP permission to cut trees up to the pipeline’s mile marker 196.29. But exactly where is mile marker 196.29? 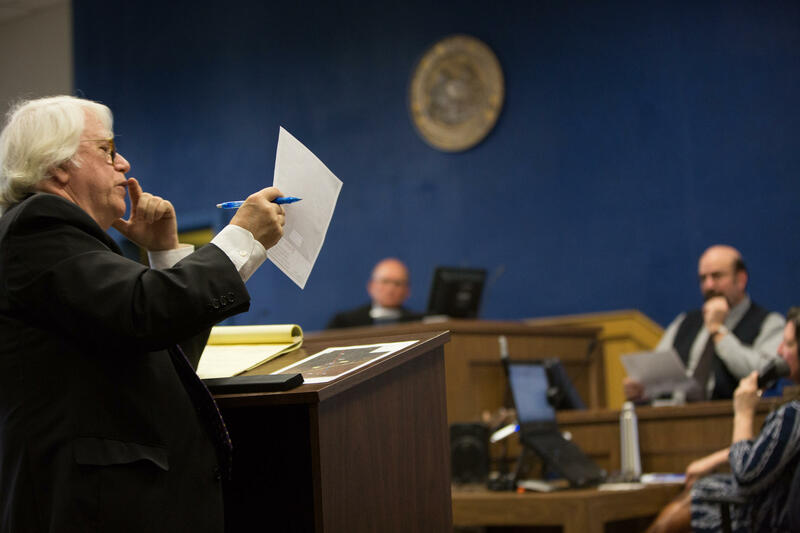 Defense attorney William DePaulo went through the map item by item, defining points, adding numbers and to reveal that some points had been rounded. Then he pulled out a piece of paper in what he called a “6th grade” measuring tool to demonstrate items on the map were not located to scale during his cross examination of MVP expert witness, Marshall W. Robinson. DePaulo, pressed the paper to the map, “Put the left corner at 196.35 and go up to 196.4 they are not the same distance are they,” he asked. “No, they’re not,” responded Robinson. Defense attorney William DePaulo cross examines expert witness Marshall Robinson about the surveyed map presented as evidence in the case. DePaulo then turned to the judge, “And that’s 5/100ths of a mile. And we know that 196.35 and 196.4 is also 5/100ths of a mile. And it should be, if the map is to scale, it oughta be the same thing. But it clearly is not,” DePaulo concluded. MVP’s lawyer R. Scott Long came back at the location question in the final questioning of his witness, Robinson. “That is correct,” Robinson replied. “You can take all the rounding errors or not errors and just round everyone around, worst case – those folks are in that area, is that right?” Long recapped, noting there was no doubt that all maps showed the rocky cliffs were in MVP’s right of way to cut trees and the tree sitters were on the MVP side of the rocks. And with that, quite unexpectedly, Judge Irons denied the request for a preliminary injunction. 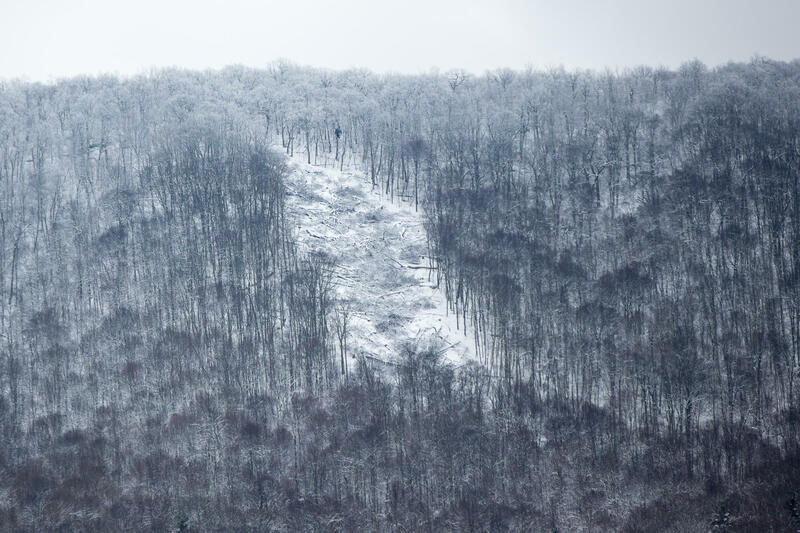 That’s problematic for Mountain Valley which is up against a March 31st deadline to fell trees in order to meet federal rules protecting endangered species. A long delay means they must wait until the next window for tree cutting. MVP received the “OK” from FERC in October and has three years to complete the pipeline under its certificate. The company’s goal is to have the 42-inch diameter natural gas pipeline operational before the end of the year. But there are plenty trying to stop it. Near the top of the ridge on Peters Mountain a tree sitters tent hovers above the recently cut right of way for the Mountain Valley Pipeline. The tree sitters are getting a welcome reception from some in Monroe County, where it was revealed in the condemnation hearings in U.S. District Court that nearly 50 percent of the county’s landowners had refused to sell MVP easements and were taken to court in eminent domain proceedings. Locals have brought the tree sitters an assortment of food from Moon Pies & homemade brownies to home-cooked bacon and hard-boiled eggs. The sitters say they’ve also received hand-delivered thank you notes. 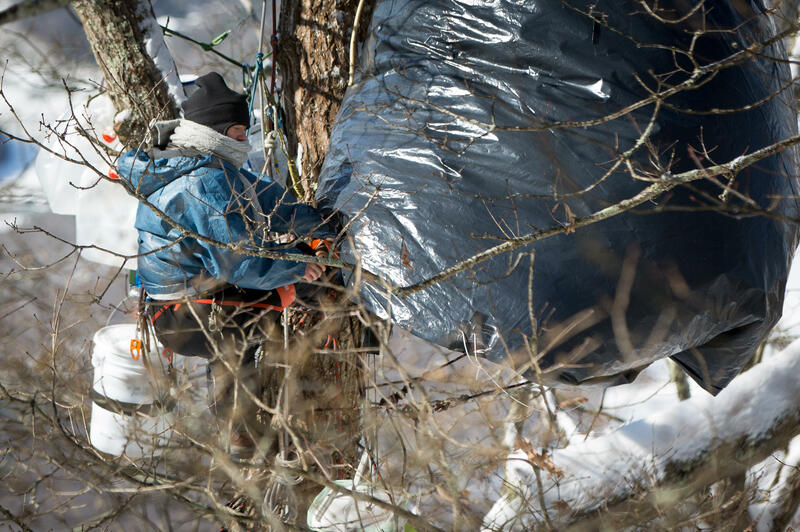 A female tree sitter, who was quoted in the story, comes out of her tent to make some adjustments to the apparatus in the wind and cold. Tree sitters and their support team refuse to reveal their names. Another involved person who called himself D.
And for DePaulo, that was the message from the treetops. “The impact of those people being up in the trees in the middle of winter storms cause people to think, ‘Why on earth are those kids up there?’ And the answer is very compelling. The answer is it makes people think about why are we undertaking this project at all,” DePaulo said. The female tree sitter says she’s been seeing strong support. “We have a really strong support network and community and it makes me feel safer and loved when I am up here. It’s really nice to have visitors,” she said. Though, that visitor part might be getting harder. The Forest Service brought their own surveyor to the site two days after the hearing, so they, too, will have measurements on the exact location of the tree sitters. 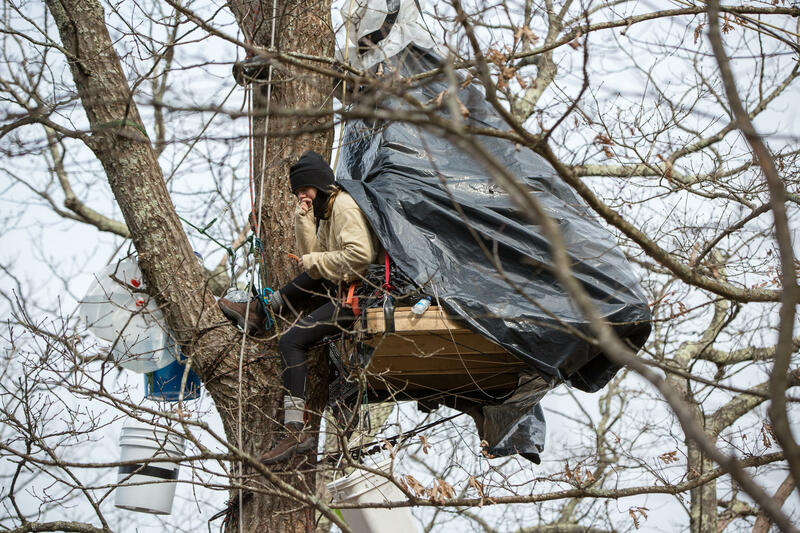 It’s unclear whether or not people will be prohibited from supporting the tree sitters by bringing in food and water and taking out refuse. National Forest Service staff also posted revised closure orders on some trees next to the Appalachian Trail describing the areas prohibited from entry and the Forest Service revised closure order. At the scene, NFS officials ok’d my presence on the rocky cliff above the tree sitters, but not further down the slope, under the actual tree sit. National Forest Service spokesperson Jessica Rubado wrote in an email that the “Forest Service law enforcement is conducting frequent wellness checks to monitor the safety of the protesters." All requests for comment to MVP contractors or Equitable Gas (EQT) staff working on behalf of MVP were directed to EQT spokesperson Natalie Cox, who declined to comment for this story. What’s next: Tree sitters say they are staying in the trees, albeit covered with snow at the moment. And, it’s expected that the judge will announce a date for a full hearing which could be as late as this summer. Nancy Andrews is a Pittsburgh based journalist and 2018 Alicia Patterson Foundation Fellow studying natural gas pipelines in Appalachia. Follow her on Twitter @NancyAndrews or @NancyAndrews on Instagram.